Sometimes you just have to mix it up a little! That's easy to do with Med Couture print scrub tops for women! From simple geometric shapes and flowers of all kinds and colors to seasonal and specialty favorites for office or hospital wear. Cheer up your mood and get smiles from your patients with these pretty prints from Med Couture Scrub Shop. What Can Print Scrubs Do for You? You probably get tired of wearing the same solid-colored scrubs as everyone else. But you can spice up your day with print scrubs any day of the week. Celebrate the first day of spring, sport some red, white and blue, spread hope for your patients or joy of the season with printed Med Couture scrub tops. Coordinate any of these fashionable tops with your solid scrub pants from Med Couture, too! The trending colors make it easy to mix and match for a unique look anytime. And, wearing prints can take the emphasis off of problem areas in your figure and look great on athletic figures, too! What Can Print Scrubs Do for Your Patients? Your patients might not always look forward to doctor's visits or hospital stays, but when they see you in colorful or festive scrubs it can really brighten their day. And that doesn't just go for kids. Colors like orange, blue, indigo and violet have been shown to help treat depression and ease anxiety and stress for everyone. Pink can help calm a patient's nerves and red can help elderly patients focus. Pair those colors with any of the great prints you'll find here, and you've got a winning combination! What Else Do Print Scrubs Have to Offer? Not only do you get prints that withstand wash after wash, Med Couture print scrubs feature the fabrics and extras that fit you right! Special blends of polyester, cotton and spandex provide a fabulous fit with a wonderful drape. Badge holders and bungees let you clip the necessities where you need them. Plenty of pockets open up lots of storage opportunities for whatever you need on every shift. Here are just a few of the pretty prints and styles you'll find here. 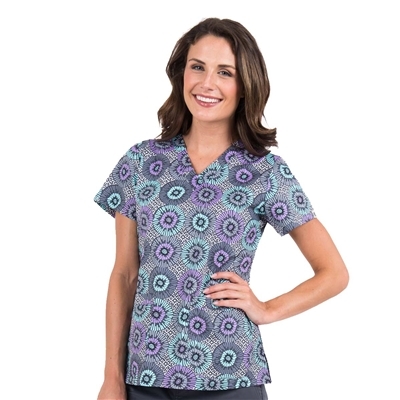 Med Couture's Activate In-Motion Scrub Top in Contiguous Shapes features shades of pink flowing in a downward direction to draw the eye away from problem areas. 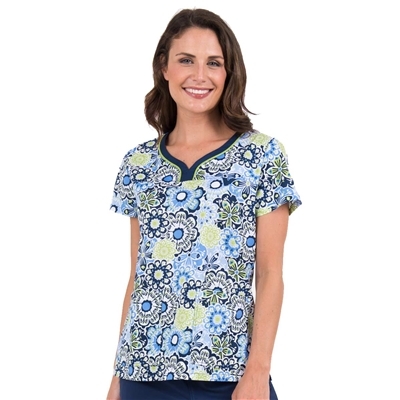 The Zip pity Scrub Top in Frilly Flutters is a polyester/spandex blend with just the right amount of flex and a fashionable partial zip neckline. 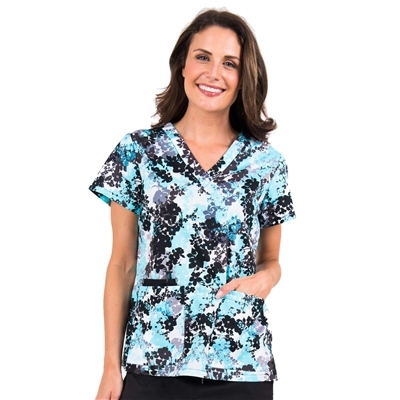 The Med Couture Lexi Print Scrub Top in Perfect Harmony comes with a curved neckline and dark piping accent. The Sky High Print Scrub Top in Poppy Petals sports a classic V-neck and zipper pockets for extra storage security. Check out all of the fun and fantastic print scrub tops for women today! You'll find something to brighten your shift and lift spirits with just the right fit to keep you looking great!